Despite the failure of discourses such as ‘urban branding’ or ‘spectacle architecture,’ huge transport infrastructures are still a necessity for cities eager to participate in the global economy. Thus, it is no coincidence that the new Santiago airport is the largest building under construction in Chile. But its size not only has to do with the number of passengers it will receive but also with the scale of its main users: the aircraft. 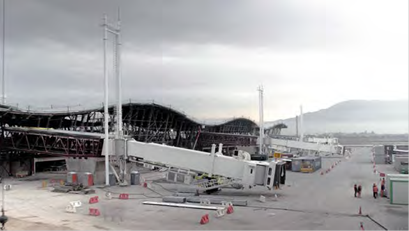 The outcome of an international public competition that comprised integral consulting of the basic engineering project, including 26 specialties, and subsequent detail engineering, the new Arturo Merino Benítez airport (amb) aims to satisfy, in a first stage, the passenger demand for the 2015-2030 period, continuing afterward up to the year 2045. For the first stage, a study determined an operation demand of 38 million passengers a year, serving 5,796 people during rush hour. Thus, not only were the capacities of the airport campus redefined (runways, taxiways, platforms, terminal buildings, parking lots, etc. 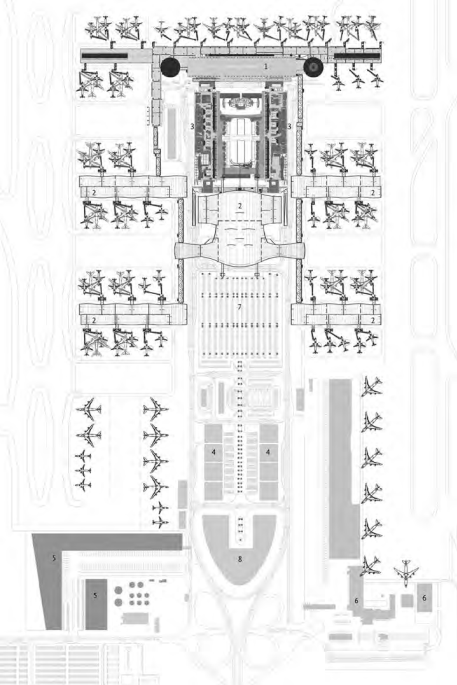 ), but also the architecture rendering each process (passport control, baggage removal, etc.) using formulas established by iata (International Association of Air Transport). 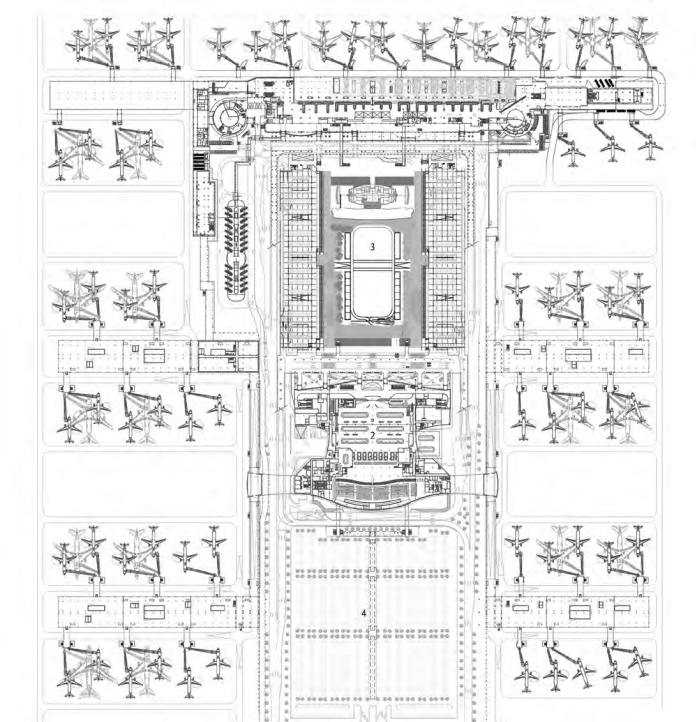 Considering these magnitudes, we searched for an architecture that understands airports as complexes where users are both passengers and aircrafts, and where the movements of the latter determine their configurations, locations and spaces. The project contemplates expanding from 18 to 67 the contact points (doors) between the aircraft and the terminal, plus 10 remote units for passengers and cargo. These points are arranged in two parallel lines of 6 piers perpendicular to the existing runways. The piers communicate with each other by dual circulation corridors that segregate exit and arrival flows. Such configuration reconciles movement areas with the existing infrastructure and the central strip of the property, where the Passengers Terminal Complex and the airport’s public area are developed. Figure 5 Masterplan. Published scale 10.000. Legend: 1. Refurbishment existent national terminal; 2. New International Terminal; 3. Central parking plaza; 4. New public buildings; 5. New cargo buildings; 6. Existent cargo building; 7. Parking; 8. Real estate development. The masterplan offers a new public dimension, encompassing in a single area those buildings destined for public facilities, protected from vehicular transit by a vegetation strip that preserves and extends the existing tree-lined avenues. Inside, a long north-south pedestrian boulevard goes up to the Passengers Terminal Complex, adding urban life to both workers’ and users’ experience. The Passengers Terminal Complex is a cohesive group of buildings - the Domestic Flights Terminal, the new International Passengers Terminal and the Plaza Central parking building - operating as a single facility. 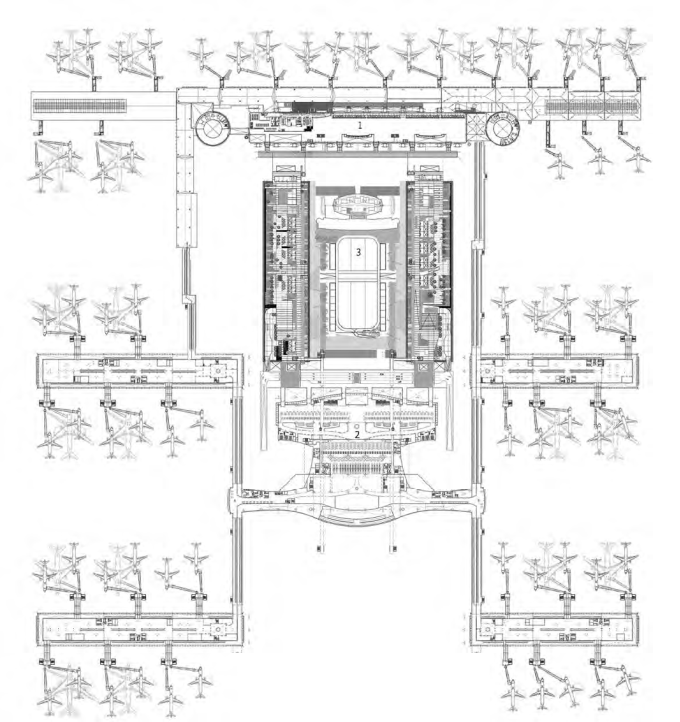 Its position generates a large public central courtyard from which both terminals are accessed. This large patio allows passengers to move between terminals through a public open space. The new International Passengers Terminal is defined from three different perspectives. First, through the processes it houses. The passengers’ entry and exit flows are split into two levels, connected by a third space equipped with facilities and technical support areas at the two main levels. This interstitial level allows simultaneous flows of passengers, reduces built areas and optimizes climate and baggage systems. Additionally, an underground level is incorporated for the flow and handling of baggage between the two piers systems. The second characteristic groups the processes according to their public will: it links the lounges with the large central courtyard of the Passengers Terminal Complex and relegates the passengers’ clearance processes to the interior of the building. 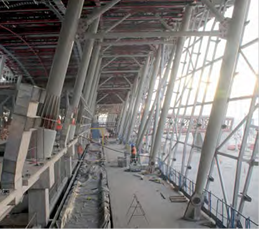 Likewise, a third large hall is designed to connect the terminal flows with the piers, oriented towards the project’s south façade with views towards the public axis and the Andes Mountain range. 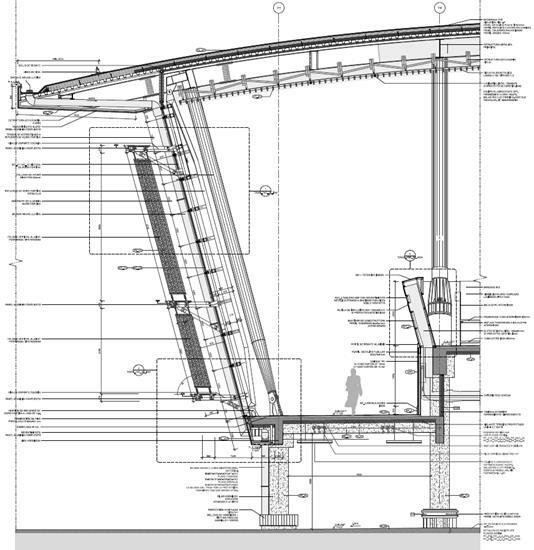 Figure 12 Pier detail section, west facade. Published scale 1: 100. Finally, a large warped roof that gains height towards larger gathering spaces is developed, referencing both the central valley’s geography and the modern airport building tradition initiated in Eero Saarinen’s twa Terminal. To the aforementioned, energy efficiency criteria are added: passive solar control strategies, a double-glass envelope and spandrel opaque panels for the exposed façades, optimizing the levels of solar radiation in the interior. Air conditioning systems - with variable frequency units - operate according to demand, while the use of green roofs in parking buildings reduces the accumulation of solar radiation heat. Design team: Alfred Moreno, Adrien Pratlong, Shawn Lawrie, Sandra Burgos, Isabel Jacome, Caterina Prenafeta, Bart Du Rang, Olga Villa, Jim Cota, Álvaro Fernández de Meza, Ingerbor Neumann, Egor Revenko, Alex Zulas. * Stantec Architecture + Amunátegui Barreau Arquitectos AIA Sergio Amunátegui segioamunategui@abarchitec.com Architect, Texas A&M University, Texas, USA, 1985. Master of Architecture, University of California Berkeley, USA, 1989. Partner at Amunátegui Barreau Arquitectos AIA. Has been involved in the design, construction, remodeling and expansion of the Santiago airport since 1998. He has also designed and built large-scale complexes in Chile, Argentina, Ecuador and the USA. Has been Adjunct Professor at the Faculty of Architecture and Urbanism of Universidad de Chile and Vice-dean at the School of Architecture and Art of Universidad del Desarrollo. Is a member of the American Institute of Architecture. Carmen Barreau carmenbarreau@abarchitec.com Architect, Universidad de Chile, 1989. Partner at of Amunátegui Barreau Arquitectos AIA. Has been involved in the design, construction, remodeling and expansion of the Santiago airport since 1998. She has also designed and built large-scale complexes in Chile, Argentina, Ecuador and the USA. Stanis Smith stanis.smith@stantec.com Architect, University of the Witwatersrand, Johannesburg, South Africa, 1978. Senior Vice President of Stantec, Vancouver, Canada. Since 1987 developing airport architecture in North and South America. Luis Vidal prensa@luisvidal.com Architect, University of Greenwich, UK, 1994. Luis Vidal Arquitectos develops architecture globally, and has authored Terminal 2 at Heathrow, UK and Zaragoza Airport, among others. Member of The Royal Institute of British Architects (RIBA), the American Institute of Architecture, he is part of the Industry Advisory Council at Cranfield University UK and for five years held the position of Associate Professor at ETSAM.